One year ago this month, millions of viewers in more than 100 countries around the world watched Billy Graham’s funeral. 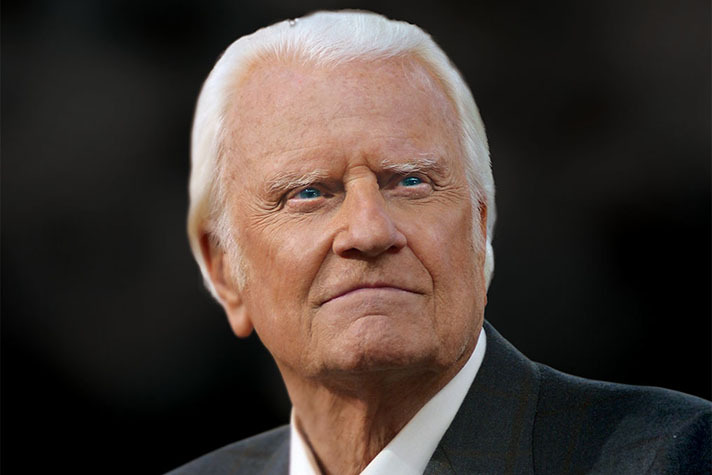 Broadcast live through multiple media outlets on March 2, 2018, the service was dubbed by some as Billy Graham’s final Crusade. The Gospel was presented clearly and repeatedly for all who watched. Mr. Graham’s own journey to Heaven, which had occurred nine days earlier, brought an outpouring of affection and thankfulness from those touched by his life and ministry. On Feb. 24, as the Graham family traveled with the hearse from The Billy Graham Training Center at The Cove in Asheville, N.C., to the Billy Graham Library in Charlotte, thousands lined the 130-mile route to pay their respects. Fire engines and ambulances stopped at every overpass, lights flashing and flags billowing. At the Library, with Mr. Graham’s body lying in repose for two days in his childhood home, more than 13,000—including former presidents George W. Bush and Bill Clinton—came to say goodbye and to thank the Graham family. Lying in honor during a rare bicameral prayer service at the United States Capitol Rotunda, Feb. 28, 2018. 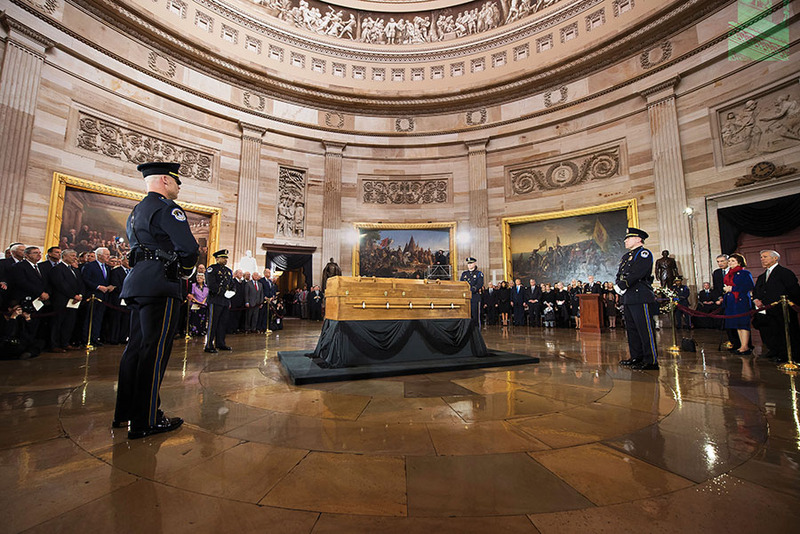 Then, in Washington, D.C., Mr. Graham’s body lay in honor at the Capitol Rotunda—only the fourth time in history that a private citizen was so honored. For many weeks following the memorial events and funeral, people continued to send condolences and memories to the Billy Graham Evangelistic Association. Many shared how they had put their faith in Jesus Christ after hearing Mr. Graham preach the Gospel, reading one of his books or watching a film or telecast. Some are now pastors, missionaries, prison ministers and Sunday school teachers. This is a direct result of the working of the Holy Spirit seeking lost souls. He alone brings sinners to repentance and saving faith in the Lord Jesus Christ (John 16:8), and we praise Him for what has been accomplished. People recalled how this man, who preached to more people (nearly 215 million in live audiences) than anyone else in history, was also a friend and counselor to presidents and other world leaders. They spoke of his humility, his obedience to God and his unswerving determination to preach the Gospel to as many people as he possibly could. The Decision America Tour drew more than 127,000 people to events in 17 cities in 2018. For decades before his passing, Christians had wondered: What will happen when Billy Graham’s time on earth is done? Who will take up his mantle? Although God has raised up many powerful servants through the ages, He has never been dependent on any individual to accomplish His purposes. One year after Billy Graham’s funeral, it is clear that God is still saving souls—and calling all believers to share the Good News far and wide. Over the past year, God has moved powerfully in hearts through BGEA’s Crusades, the Decision America Tour, Internet Evangelism and other ministries. The Billy Graham Library in Charlotte, a hub for many of Mr. Graham’s memorial events, including the funeral, saw attendance increase by more than 48 percent over the previous year. This “ongoing Crusade” also saw an increase in total decisions for Christ in 2018. 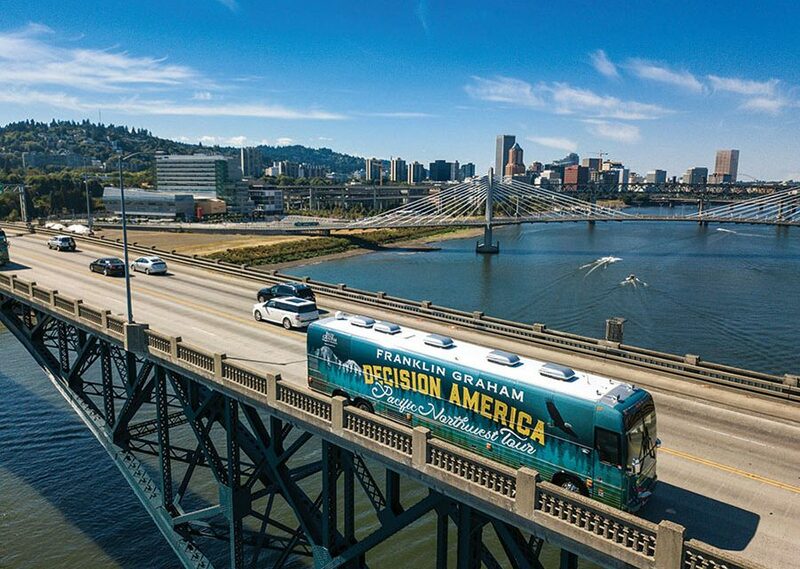 Franklin Graham’s Decision America Tours in California, Oregon and Washington drew more than 127,000 people in 17 cities. More than 117,000 attended either a Franklin Graham Festival or a Will Graham Celebration, with more than 5,500 deciding to begin a relationship with Jesus Christ. 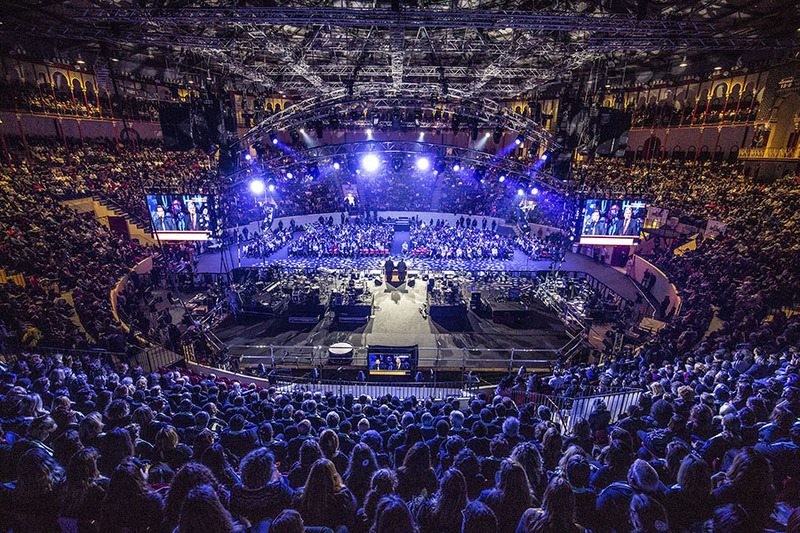 More than 1,000 people responded to the Gospel during a Franklin Graham Festival in Lisbon, Portugal, in April 2018. BGEA’s Search for Jesus internet evangelism outreach maintains evangelistic websites in English, Spanish, Portuguese, Arabic and Chinese. In addition, trained volunteers chat with visitors, reply to their questions, mentor them in online discipleship courses and converse with them through social media. One woman, who had broken her marriage vows and left her husband and son, watched Billy Graham’s funeral and decided to go back to her family. Still, the guilt of what she had done left her suicidal—until she connected online with a Search for Jesus chat coach who led her to Christ. “I came lost, pathetic and hopeless, but now I’m free,” she said afterward. In 2018, some 8.4 million people were confronted with the Good News through Search for Jesus. And in a world rife with crisis, conflict and natural disaster, chaplains with the U.S.-based Billy Graham Rapid Response Team deployed to 40 locations in 2018, demonstrating the compassion of Jesus Christ and sharing the hope that comes through the One who “heals the brokenhearted and binds up their wounds” (Psalm 147:3). The Canadian Rapid Response Team responded to an additional 13 crises, and chaplains in Australia and the United Kingdom responded to several incidents, each with the love and truth of Christ. While God gifts some of His followers specifically as evangelists, He has given all believers clear instructions to evangelize. And regardless of what individuals He might raise to prominence on the world stage, we, His children have our marching orders: “Go into all the world and preach the gospel to every creature” (Mark 16:15). Learn more about the Good News of God’s love today.